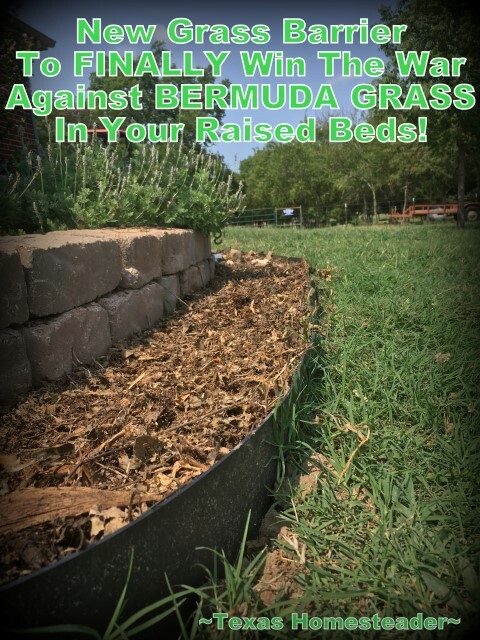 Keeping Bermuda Grass Out Of Your Planting Beds For Good!! RancherMan & I had a porch extension built last year. But wait. WHAT’S THIS??? Even though we took precautions to keep the Bermuda grass out, it tried to march into our beautiful raised beds anyway! 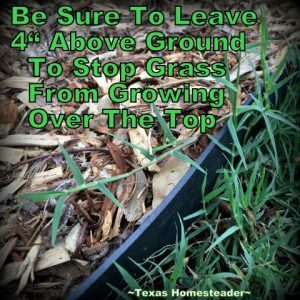 As anyone who’s battled (and LOST) the war with Bermuda grass in their flower beds knows, it’s almost impossible to eliminate. The underground rhizosomes break easily, leaving the next generation of Bermuda-grass-misery ready to thwart your best efforts. 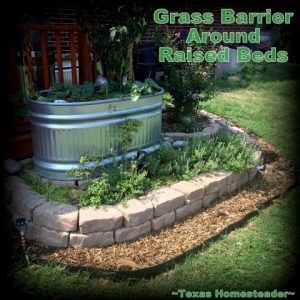 In researching ways to tame the Bermuda-grass, RancherMan stumbled upon a grass barrier that looked promising. It stops the underground rhizomes as well as the above-ground runners. How exciting! I contacted the company to see if they’d be interested in sending me a sample of their product to try & review. They agreed and the barrier was sent to me promptly. As usual, remember that just because an item is offered at no cost in exchange for my review, I owe it to my readers to be honest and open about the pros and cons of the product I’m reviewing. I always disclose to the manufacturers that I will not offer a false positive review in exchange for free product! Our long lasting barrier is made in the USA from 100% recycled HDPE. Grass Barrier is not brittle like injection molded material and does not splinter like fiber and composites. Our barrier has a smooth surface for a clean appearance and doesn’t hold dirt. We use 100% HDPE plastic so our product will never rust like metal edging. Grass Shield can last over 100 years & has an ASTM D 4833 puncture resistance of 200 pound-force. Well that sounds good to me! Let’s give it a try. The barrier arrived quickly after we ordered it, I had the barrier in my hands in just days! It came in one large roll. As instructed we unrolled it in that hot Texas sun and let it relax & become more pliable. Then we easily cut it to length with an ordinary pair of tin snips. We were instructed to use a trenching shovel to bury the barrier 6″ below the ground, leaving a 4″ lip above ground. We used a flat-head trenching shovel and cut the soil 6-8 inches down, pushing & pulling the shovel to make a narrow opening in the soil. When the area was ready to accept the barrier we slid it into place, chunking up the soil on either side to snug it in. Then we stood back & looked at our handiwork. Hummm, those waves… RancherMan was not a fan of that look at all. Maybe there wasn’t enough room for the barrier to settle smoothly since we cut only a narrow slit in the ground. Perhaps the soil is forcing the barrier into awkward angles? So we pulled it all out and started over. This time he used a sharp-shooter shovel and dug a wider trench 3″ to 4″ wide. We felt that would allow the barrier to bend more gently & hopefully keep the barrier from rippling. To keep Bermuda rhizomes from going under the barrier it’s recommended to bury it 6 inches deep. This gives a 4″ lip remaining above the ground to keep the runners from hopping over the barrier & into your beds. But RancherMan didn’t care for the look of that much barrier above ground. So we contacted the folks at Lewis Bamboo and asked them if we could install ours a little deeper. They responded that we could, but with less than 4″ above ground we’d need to maintain the grass more often to make sure it didn’t grow over the barrier. So RancherMan left about 3″ above ground. After installation we replaced the soil evenly on both sides as instructed on their site. The rippling was better but still very noticeable. I think what is causing the ripples is the soil compression during thermocycling. This should be lessened once the soil has properly settled from being excavated. I guess we’ll see. The barrier was installed 2 months ago & it’s still wavy. In all fairness we’ve been dealing with drought so I’m not sure how much the soil has actually settled. I’ll be watching this & be sure to report back. After installation I used an herbicide to kill the Bermuda Grass within the barrier area. Now you know a one-time application will almost never actually kill Bermuda. So I waited until I saw sprouts from underground rhizomes and sprayed again. The drought kept the grass from taking in the herbicide completely. I really needed to assure the grass was dead before testing. I actually had to spot spray 4 separate times after the initial herbicide spraying, so stay diligent to kill those sprouts for good! After waiting a week following the final spot spray I saw no indication of sprouting grass. So I finally moved on to the testing phase. We didn’t want bare ground between the barrier & the raised beds so we added shredded wood mulch in this area. It softened the look and I was hoping that filling in this area would help round out those ripples. But it doesn’t seem to have made a difference. RancherMan suggested crushed rock or pea gravel might be better. If we decide to go this route I’ll be sure to share results. For now we’re using wood mulch because we can obtain it for free in our county. Plus I think it looks nice too. But with only 3″ above ground I see the grass will easily be able to grow over the barrier. RancherMan’s promised to keep the grass maintained. And if we use gravel between the barrier & the raised beds it should make it even more difficult for grass to take hold. But be aware there’s a reason they recommend the ratio of barrier beneath vs. above ground. For the best effectiveness and as instructed, bury 6″ underground, leave 4″ above ground. After a couple of weeks I saw no further resurgence of Bermuda grass sprouts, so I’m comfortable that it’s finally dead. And there’s no indication the Bermuda grass is sneaking in from beneath the barrier either. I’m pretty hopeful that this means I can finally win the war against that blasted Bermuda grass in my raised beds. Hip-Hip, HOORAY!! Roll grass barrier out in the sun for a while to soften it somewhat & make it easier to manipulate. Don’t just dig a deep notch & slide the barrier in. Go head & dig a 4″ wide trench. Trust me, installation will be easier. When they say leave a 4″ section above ground, take their word for it. Your future maintenance will be lessened. In installing the grass barrier we used a paint pen line to mark the above-vs-below ground section. This made it easier for us to see when we had the barrier level. We installed this barrier during the heat of summer and during a wicked drought. Even watering the ground to try to soften it, we struggled. It’s much easier to install when the ground is soft, and much more pleasant to install when it’s not 100 degrees outside! Back-fill the excavation dirt quickly while it’s still loose to keep the dirt from drying out & becoming hard clods. To date, the barrier continues to have a ripple in its appearance. RancherMan’s not fond of the look of the required 4″ of barrier above ground. All in all I’m pretty happy with this grass barrier. I’m planning to purchase more this spring to line my veggie garden where Bermuda is also a constant battle. Do you face the same Bermuda grass battles? Now there’s HOPE! Feel free to contact the Grass Barrier folks (various links below). 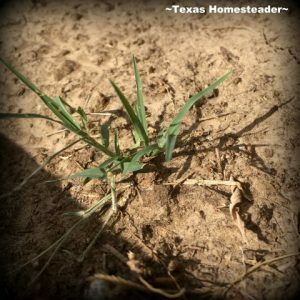 Tell ’em the Texas Homesteader sent ya! 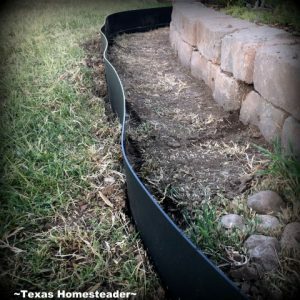 This entry was posted in Blog Posts and tagged Gardening, Product Review on September 30, 2018 by Texas Homesteader. I live in Florida and have used a similar product to what you have used here. I never got mine straight either. We have definitely had enough rain this year to pack the dirt and the ripples are still there. We ended up ripping it all out and guess what…I weed constantly. I hope this works for you better than us. I guess we just couldn’t get past the sloppy look in my beds. It looks like you have a section of mulch between grass and the stone wall of the garden. What I use on stuff I don’t want and that isn’t too close to things I do want is white vinegar – cider vinegar works well too. I don’t think we have B. grass, but we have other stuff ranunculus/butter cup is the main annoyance and I hate to get too aggressive with that because of the decline of pollinators who like it. But the grasses we do have are a pain in the neck too. I have a couple of areas of perennial garden out here that I work sporadically trying to keep them pretty. I put down thick layers of newspaper (cardboard in a pinch but it doesn’t last as long as thick newspaper) and cover them with bark nuggets and along the edges I often put down a stream of vinegar. Aaah, the fight against what nature wants to do VS what we want. Nice! It still looks so much better than the cheap stuff you see with the big round top and a bonus that it won’t rust after a couple of years like the metal edging. Please keep us updated on this product! 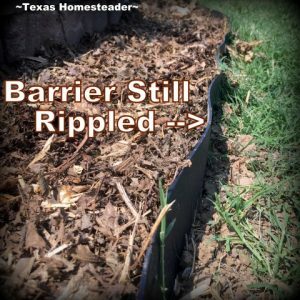 We battle the horrible Bermuda grass too and I want to simplify our landscaping work since my labor force is entering the paid market over the next few years (kids growing up!). This looks more promising than many other options.